Hyperion's lavishly produced and succulently informative series dedicated to the Romantic Piano Concerto has unearthed some truly buried treasure. 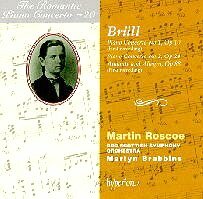 The memorable discs dedicated to Dohnanyi, Paderewski and Medtner spring to mind but in my book; none is more striking than this sensational Brull disc. I had never even heard of this composer who was apparently quite a prodigy, composing his first concerto at the tender age of fourteen! Don't expect any immature squabbling, this is indeed a work to rank with the best barnstormers around for cliffhanging virtuosity. The opening movement takes thirteen note-spinning minutes and the broad memorable melody that dominates the music is quite inspirational. A short but tender Andante preludes the dashing and whirlwind Presto Finale, a logical and tempestuous conclusion to what is one of the most astonishing concertos ever composed by a teenager. Martin Roscoe is the ideal advocate, playing with disarming skill and virtuosity; he indeed finds much devilish trickery in the latter Presto. The rare Andante and Allegro is a much later work, in a Konzerstuck mode and contains much fine melodic invention. Roscoe's impeccable delivery cannot be faulted and he receives some outstanding accompaniment from the BBC Scottish players. There is a certain heroic grandeur about the Allegro vivace that made me recall the Brahms D Minor although to be fair, Brull's music is quite originally different. This brings us to the 2nd concerto, a similarly conceived work to its predecessor but perhaps more memorable. Certainly the symphonic sweep of the Allegro moderato carries all before it although the piano is given the lion's share of the melodic intuitivity. I could hardly agree more with the note-writer's veiled comparisons with Beethoven's Fourth Concerto, indeed the lyrical outpourings of Brull's barnstormers is full of Beethovenian spirit lurking in the shadows. All is solved in one memorable dash to the finish line in the Allegro movement that has Roscoe at his most daring in terms of exhilarating risk-taking whilst Brabbins and his players are more than a match in this jolly romp! Hyperion's recording is on the dry side but this suits these concertos superbly with just the right balance between piano and orchestra. Dr Harmut Wecker's notes recreate some of the forgotten nineteenth century traditions to life in an informative but characterful essay. Those who have been collecting this wonderful series need obviously not hesitate but Brull deserves to win wider currency for these works, which should indeed be in the repertoire of any self-respecting concert pianist.